[S836] 1910 U.S. Census, Ohio, Fairfield County, Liberty Township, ED 70, sheet 17A, line 33, dwelling 174, family 174, Ohio, Fairfield County. [S2337] Clara J. Christy Langel Cemetery Marker, Mt. Zion Cemetery, Liberty Township, Fairfield Co, OH. [S2337] Clara J. Christy Langel Cemetery Marker, Mt. Zion Cemetery, Liberty Township, Fairfield Co, OH, Hard to read date on this photo. Says died aged 47 years, some months, some days. [S238] 1900 U. S. Census, population schedule, Ohio, Fairfield County, Liberty Township, Basil Precinct, ED 16, sheet 3B, line 95, dwelling 71, family 74. [S2337] Clara J. Christy Langel Cemetery Marker, Mt. Zion Cemetery, Liberty Township, Fairfield Co, OH, Hard to read date on this photo. [S2336] Arthur G. Langel Cemetery Marker, Mt. 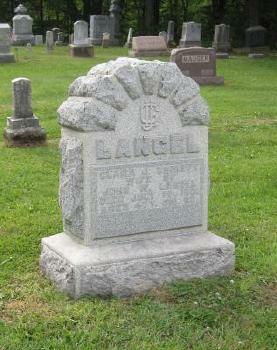 Zion Cemetery, Liberty Township, Fairfield Co, OH.